You know, if you're anything approaching a "tourist" like me, it really pays to stay up on what's going on in town. Otherwise you're very likely to miss a temporary exhibit that you'd really have loved to have seen. That was quite nearly the case yesterday. I'd been to visit the new Freedom Farmers Market (I'll post about that later this week), which is at the Carter Center off of Freedom Parkway, when I decided to pop into the Carter Center Museum. I'm so glad I did! Their current special exhibit finishes today. 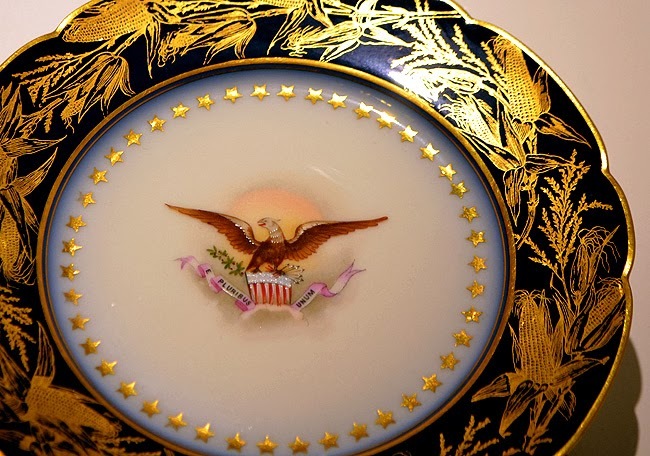 Diplomatic Patterns: A Sampling of White House China is an extremely rare glance at some of the plates and presentation pieces used when entertaining at the White House, including artifacts that date back to President Lincoln's time, and earlier. I'll share here a few of my favorite pieces from the exhibition, finishing up with my two personal favorites. But let me say that I absolutely love the piece shown above! I just don't recall which administration it's from, but it was later one. 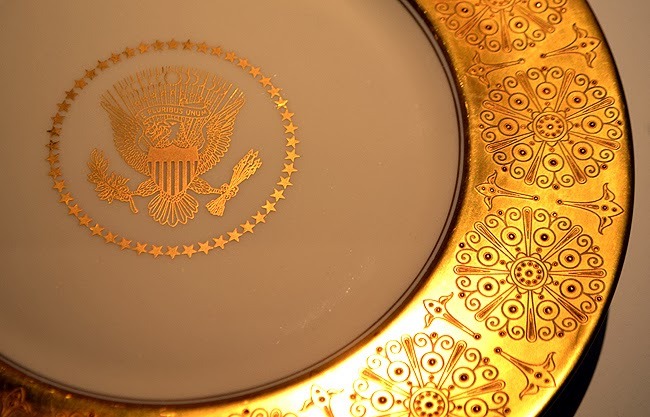 About Diplomatic Patterns, the Carter Center Museum website says, "Very rarely do guests to The White House even get to see the china collection, but visitors to the Jimmy Carter Library and Museum will be able to take a close look at plates used for State Dinners and presentation pieces given to U.S. Presidents. Presidents and first ladies have used White House social events as a means of conveying national honor and extending diplomatic relationships with other countries." So, a rare treat indeed is seeing this collection in person. Even though I lived in Washington, D.C. for nine years, I never had the opportunity to visit The White House, although I walked and biked by it hundreds of times. I suppose I'll have to make an inside visit as a tourist on a future visit. 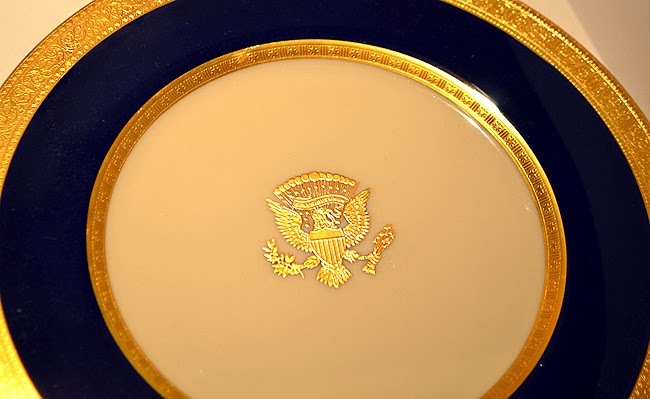 This service, which includes stemware, is decorated with the presidential coat of arms in gold, a dark green border and an etched gold band. This was part of the Carter service, although Mrs. Carter often used the Truman White House service for state dinners. While there are lots of plates in the exhibition, there are quite a few more unique pieces as well, including this beauty. 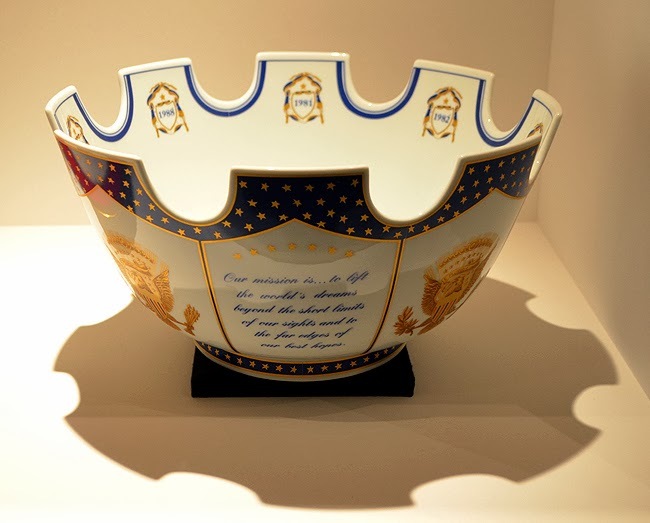 The inscription on the face of the bowl reads, "Our mission is...to lift the world's dreams beyond the short limits of our sights and to the far edges of our best hopes." The Bald Eagle is prevalent throughout the collection, but that's of course no surprise. What was surprising was just how incredibly diverse the china patterns are from administration to administration. 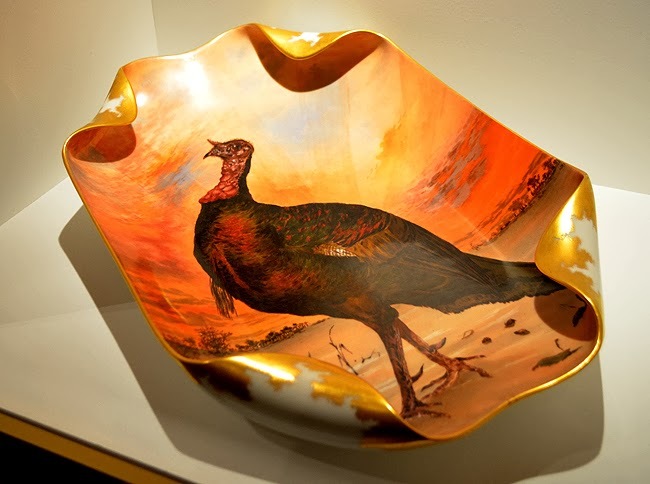 Typically purchased by the First Lady, it's safe to say that each expressed her own personality and patriotism in the selection of her White House china. See, I told you there were some rather unique pieces! I don't recall which administration this piece is from, but it's from a relatively earlier one. I love the shape, but I have to wonder how this particular piece was used. Upon entering the exhibit, you'll see one of the Carter administration china plates, decorated with images of fly fishing hooks. As it turns out, President Carter learned how to fly fish while visiting Camp David, and evidently he learned quite well how to make his own fly fishing lures...thus the design of the the plate. Okay, now to my two favorite pieces in the collection. Although I love the pieces with gold bands with the golden Bald Eagle in the center, the others are remarkable for a number of reasons. 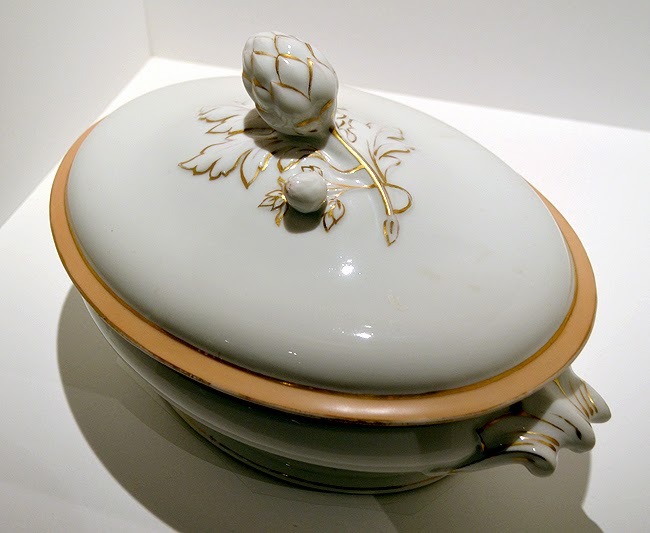 This soup tureen (above) belonged to the Lincoln White House. The service was ordered in 1865 by First Lady Mary Lincoln shortly before President Lincoln was assassinated. This particular pattern, was purchased in 1846 by the Polk administration. 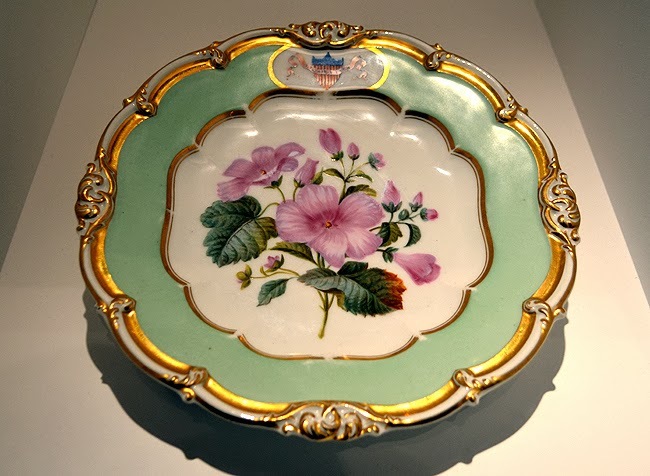 The 120 dessert plates in the collection—one shown above—were decorated with the shield of the United States and only the dessert plates were decorated with a wide range of flowers, painted in the middle of the plates. 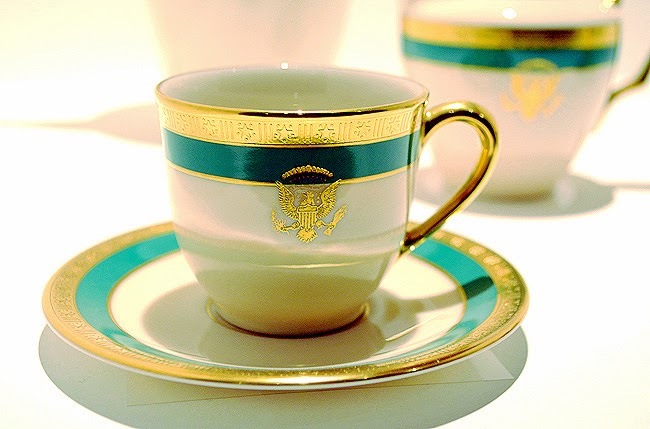 It's said that many think this is the most beautiful of all the White House china. Again, sadly, today is the last chance to see Diplomatic Patterns—and such a rare opportunity it is. If you are able to make time to get over there to see it, it'll be well worth it. The exhibition is about halfway through the Carter Center Museum, so plan plenty of time to take that in as well.